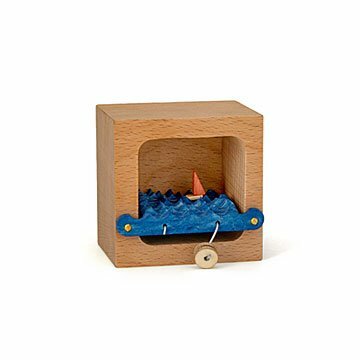 Wind up this handmade box and sail into a daydream as the little boat inside moves along rolling waves. A gentle breeze kissing your cheeks. The smell of salty water. Miles of endless blue. Even when it's only a daydream, you'll feel like you're at sea when you look at Michele Forbes' moving sailboat diorama. Wind it up and watch the waves within the hand-crafted box start to roll. Among them, a little red boat floats along without a care. Keep it on your desk to wind when you need a moment of calm, or give one to someone who's about to embark on a new adventure. After all, the world contains oceans of possibility. Handmade in Washington. Michele Forbes is a lifelong creative living in beautiful Vancouver, Washington. She discovered the whimsical little sailboats she now handcrafts when a friend of her daughter created the design. When he decided to stop making them, she couldn’t bear to see them disappear forever, so she’s been making them herself ever since. (With the help from her husband and a local CNC machinist.) She’s honored to continue to share the joy the wave-filled boxes bring with the world. Bought this for my brother's birthday. He lives on an island and loves sailing the ocean. This moving sculpture is so magical! Thank you for helping me deliver another perfect and meaningful gift!